The students’ gasps were audible when Dr. Lawrence Tabak, principal deputy director at NIH, shared how many times his medical school applications were rejected. Not once. Not twice. No. His 29 applications were all rejected. 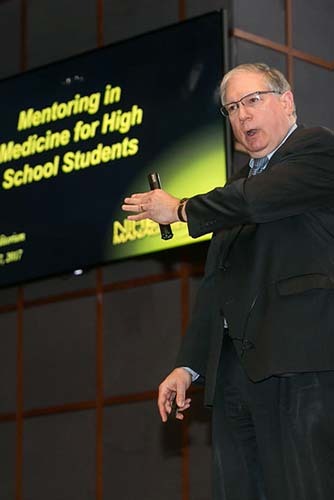 Perseverance, motivation, curiosity, and the importance of mentors were just a few of the themes of the Mentoring in Medicine event on April 7 at NIH. 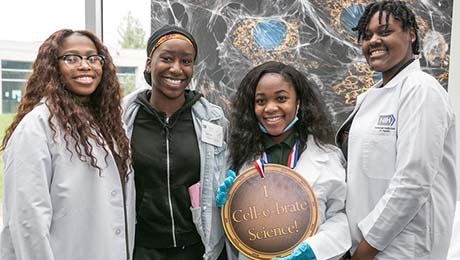 Students “cell-e-brate science” at NIH. More than 450 middle and high school students from the Washington, DC, area attended the fourth annual event. Science Day was a partnership between NLM, the National Institute on Minority Health and Health Disparities, the Friends of the National Library of Medicine, and Mentoring in Medicine, a nonprofit organization that works to inspire disadvantaged and low-income students to become health care professionals. In her introductory remarks, Betsy Humphreys, deputy director of NLM, stressed that there are many different paths to a scientific career. But her main message for the students was timely and evergreen: Knowledge builds upon knowledge. Through speeches, demonstrations, and hands-on activities, students got to build upon their knowledge by learning what it might be like to work in a lab, a medical office, and, of course, a medical library. Keynote speaker Lawrence Tabak, DDS, PhD, gave an overview of NIH and shared his personal story. He attended the only college he could afford, City College, because it was free if he maintained a B average. He basically did three things in college: maintain that B average, play hoops, and work full-time to cover his living expenses. Dr. Lawrence Tabak gave an overview of NIH and shared his personal journey. There weren’t any expectations that he would attend college. No one in his family had even graduated with an academic diploma from high school before. And his father? “The only thing he ever gave me was a Y chromosome,” explained Dr. Tabak. It took a minute, but the students chuckled when they understood. A few nodded in sympathy. After graduating with that B average and being rejected for medical school 29 times, Dr. Tabak went to graduate school for a master’s degree at Hunter College, which again was free. From there with the help of mentors, he attended Columbia University School of Dental and Oral Surgery, where he graduated last in his class. This admission led to more gasps from the students. He challenged the students to think about what you’re called when you graduate last from dental or medical school. The answer: Doctor. From there, Dr. Tabak told about his career as a research dean at a medical school and his journey to NIH, which started in 2000 when he became director of the National Institute of Dental and Craniofacial Research. Today Dr. Tabak is not only the principal deputy director of NIH, he is the deputy ethics counselor of the agency. She explained that students from all over the country wished they had the opportunity to be at NIH for this program. 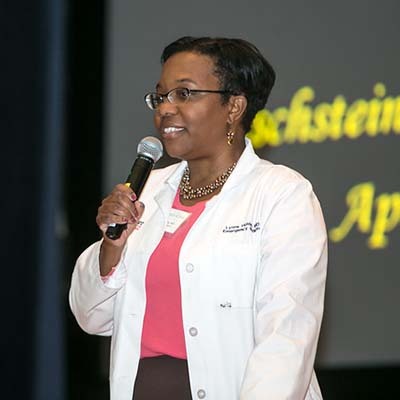 Dr. Nakela Cook of NHLBI stressed the importance of having mentors throughout your life. Dr. Jeff Day, informatics fellow at NLM, summed up his career like this: “I’m just a guy who draws medical stuff.” But when the students laughed in delight at his medical cartoons and videos, they knew just how rewarding and fun it could be to combine a career in medicine with a career in cartooning. 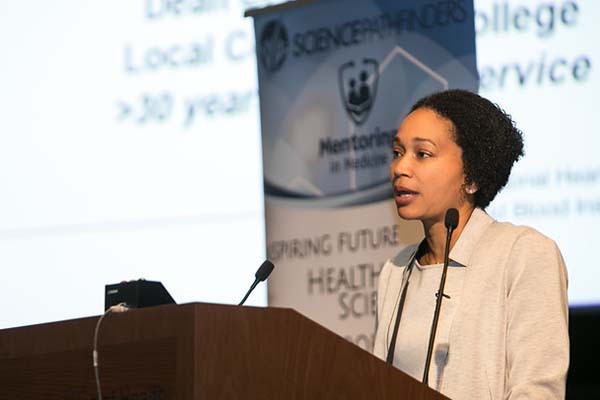 Nakela Cook, MD, a medical officer at the National Heart, Lung, and Blood Institute, grounded her talk in the importance of mentors. On the screen behind her, she shared photos of her mentors along the way. They ranged from her parents to professors to physicians. Michael Wolfson, PhD, talked about the future and how the institute where he works—the National Institute of Biomedical Imaging and Bioengineering—harnesses the power of technology. 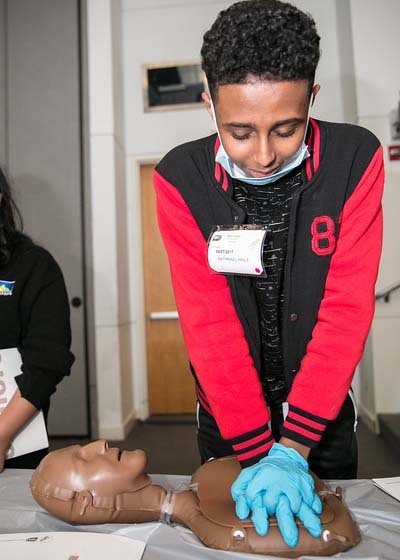 Students experimented at hands-on activity tables, organized by several NIH institutes, Mentoring in Medicine, and the Association of American Medical Colleges. Any student who wanted to know what it was like to sew someone up after surgery had a chance find out how challenging and interesting it could be by sewing up a slit in a banana peel. At another table, licorice, marshmallows, and gumdrops were fashioned into strands of DNA. Other activities included teaching how to remove a foreign object from the eye, testing your sense of smell, and exploring ways to watch sugar intake. And any student who wanted to dress for success could don a mask, gloves, and coat just like many medical professionals. A student practices giving chest compressions on a dummy as part of learning about cardiopulmonary resuscitation (CPR). A student learns what it might be like to sew up a patient after surgery by stitching up an opening in a banana peel. Tamia Martin of John Haden Johnson Middle School in Washington, DC, says she woke up excited to attend the Mentoring in Medicine event. “Medicine is here to cure us and improve our lives,” she said, but how exactly that happens was a mystery to Tamia. Later in the day, she would learn that the mystery of medicine begins with young people like herself who grow up motivated, curious, and persistent. Kyrese Jenkins, also from Johnson Middle School, had a personal interest in attending the Mentoring in Medicine event. He had a close relative die of cancer, and he wanted to learn more about the disease and the side effects of the medicine to treat it. He was in the right place to learn. For Dewayne Artis, also a student at Johnson Middle School, coming to NIH was a perfect opportunity. “Science is my favorite subject,” he said. Cuong Nguyen, 17, of Laurel High School in Maryland hopes to figure out if he wants to go to medical school. He told NLM in Focus, he’s debating between studying neuroscience or becoming a neurologist. “I see the brain as a majestic part of the body,” he said. Cuong knows what it’s like to see someone struggle as his grandmother, who suffers from a neurological disease, lives with his family. And on Friday, April 7, 2017, the NIH campus was the perfect place for 450 middle and high school students to learn, to laugh, and to discover. AcknowledgmentsThe following staff from NIH and Mentoring in Medicine were exhibitors: Lauren Amable, National Institute on Minority Health and Health Disparities (NIMHD); Patrice Armstrong, NIMHD; Cara Breeden, National Institute on Alcohol Abuse and Alcoholism; Kristin Browne, National Library of Medicine (NLM); Ruth D. Caraballo, Mentoring in Medicine; Kelvin Choi, NIMHD; Ryan Christensen, National Institute of Biomedical Imaging and Bioengineering (NIBIB); Christine Cooper, NIBIB; Stephanie Dailey, National Institute on Aging; Jeff Day, NLM; Carla Easter, National Human Genome Research Institute (NHGRI); Kate Egan (NIBIB); Hank Eden, NIBIB; Alex Gorbach (NIBIB); Faith Harrow (NHGRI); Tom Johnson (NIBIB); Ray MacDougall (NIBIB); Angela Moses, Association of American Medical Colleges (AAMC); Melinda Moyer (NIAAA); Ashleigh Moses (AAMC); Shelly Pollard, National Institute of General Medical Sciences; Tammy Reddick, NIMHD, Adi Rosario, NIMHD; and Gillman Toombes, National Institute of Neurological Disorders and Stroke; Elizabeth Tuck (NHGRI); and Rosanne Wise (NHGRI). The following scientists participated in “Lunch with a Scientist”: Will Aklin, National Institute on Drug Abuse; Rosalina Bray, Office of the Director; Dottie Castille, National Institute on Minority Health and Health Disparities (NIMHD); Carla Easter, National Human Genome Research Institute; Daniell Haney, National Heart, Lung, and Blood Institute; Carl V. Hill, National Institute on Aging; Charisee Lamar, Eunice Kennedy Shriver National Institute of Child Health and Human Development; Priscah Mujuru, NIMHD; Rob Rivers, National Institute of Diabetes and Digestive and Kidney Diseases; Victoria Smith, National Institute of Neurological Disorders and Stroke; and Xinzhi Zhang, NIMHD. The Planning Committee members are the following: Courtney Ferrell Aklin; National Institute on Minority Health and Health Disparities (NIMHD); Pat Carson, National Library of Medicine; Lynne Holden, MD, Mentoring in Medicine; DeLoris Hunter, NIMHD; and Rebecca Newton, NIMHD. NLM coordinator Pat Carson would like to thank the following staff who worked behind the scenes to make Science Day a success: Anne Altemus, Bijan Bagheri, Kathy Cravedi, Alise Crutchman, Michael Detweiler, Allison Fisher, George Franklin, Linda Frierson, Tammi Greene, Melanie Johnson, Aziz Karawa, Chianti Kight, Lilly Kramer, Janet Laylor, Vivian Le, Harold Lindmark, Robert Lun, Kathy McKay, Mary Miller, Melanie Modlin, Tara Mowery, Sandeep Nair, David Nash, Aresh Pahlavan, Sara Tam, Felicia Torchiano, Marilyn Williamson, and Constance Young. Dr. Lynne Holden of Mentoring in Medicine would like to acknowledge and thank the following people from Mentoring in Medicine: Eric Acosta, Nowah Afangbedji, Gabrielle Jean Baptiste, Ruth D. Caraballo, Gordon Carr, Farhana (Anika) Choudhury, Micheleine Guerrier, Bryant Meythaler, Andrew Morrison, Natasha Pena, Kesha Silvera, and Sydney Smith. An excellent program. Thank you for sharing this post. We appreciate your taking time to comment! We agree. The program is terrific. One of the volunteers told me that she was “so happy to pass on her passion.” I think that’s the way we all felt!